As I sat down at the food court today (with my Subway sandwich, ironically enough), I noticed this tray liner at the next table. 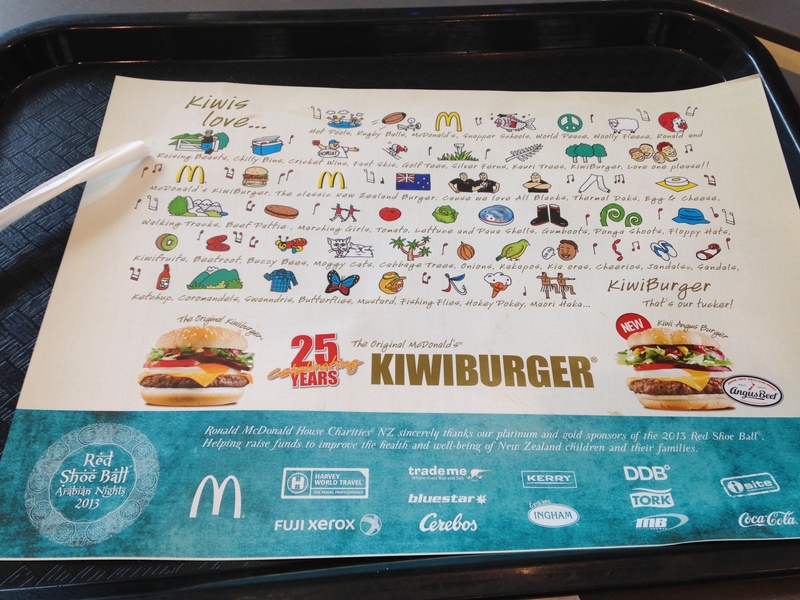 I find it to be a smart marketing strategy, as A) the rhymes are catchy, and B) I now feel the urge to try this Kiwiburger while I’m here, just for the experience of it. What do you think, New Zealanders – an accurate representation? This entry was posted in Food & Drinks, New Zealand Life and tagged Fast Food, Food, McDonald's, New Zealand, New Zealand Food. Bookmark the permalink. Funny you should ask. Suzie and I went there today to try Kiwiburgers (she’d never had one!) and … it was pretty much your basic McDonald’s food. But I can say I’ve tried it! How funny – all a part of localizing McD’s marketing. Yep! I remember them doing a similar marketing campaign for Washington State – saying where exactly the potatoes, veggies, beef, etc. came from. Guess it works! Beetroots on my burger is definitely something that’s going to take a while for me to get used to! Now the kumara fries at Burger Fuel, on the other hand … those I got used to very quickly.